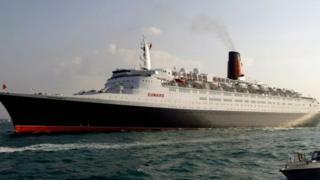 A new scheme for the QE2 ocean liner is being developed and the vessel will not be scrapped, the owners say. The former Cunard ship has been moored in Dubai since 2008 and proposals to turn it in to a hotel in the Far East have not come to anything. DP World, which owns the vessel, told Cruise Arabia and Africa a new plan was being developed. The liner was launched from the River Clyde in 1967 and its home port was Southampton for 40 years. Plans had been floated to sail the ship from Dubai to China so it could be refurbished as a 400-room hotel in 2013, but the ship remains in Dubai. The 293.5m (963ft) former cruise-line flagship carried almost 2.5 million passengers and completed more than 700 Atlantic crossings following its launch from the John Brown Shipyard in Clydebank in 1967. It sailed from Southampton for the final time in November 2008. What do you do with an old ocean liner?